I was born and raised in south Arkansas, and am still a proud resident of this beautiful state. I grew up with a sense of pride in my heritage, both as an American and as a Southerner. My family history includes oral traditions of ancestors who fought on both sides of the Civil War…of men walking the picket lines at night seeking out a beloved cousin fighting on the opposing side, for the purpose of sharing news of loved ones back home. I was raised with a sense of respect for soldiers on both sides of that horrible war. Participants on both sides of that war were largely made up of decent men fighting to defend their homeland. From the Union perspective, the Confederate soldiers were rebels fighting against their own country. From the Confederacy perspective, the Union armies were invading their homeland. I’ve always struggled with discussions on the topic of what causes were represented by each side of that war. The oversimplified version in the history textbooks tended to express the causes as simply slave states versus free states…as abolitionists versus slave owners. I always felt the need to push back against this view…to defend my Southern heritage. It’s not that the slave –vs- free narrative is false…it is factually based. Rather, it is that it fails to adequately express the complexities of the issues at the time. More importantly, it fails to express so much of what is good about our Southern heritage. General Robert E. Lee is a good example of what I’m talking about. General Lee was a product of his time and his culture. Some of his views seem very oppressive by our standards. Some of his views seem very liberal by the standards of his culture and historical period. Before the war, Lee argued against the institution of slavery. He also argued against secession from the Union. Yet, when his home state of Virginia seceded from the Union to join the Confederacy, Lee chose to fight for his homeland. There is something to be said for Lee’s sense of loyalty, honor, and duty to his homeland, regardless of the broader issues of his time. In every earthly heritage (aside from our spiritual heritage in Christ) there is both good and bad. There are things worth honoring and things to be repudiated. The South is often remembered for slavery, bigotry and racism…things to be repudiated. However, the South also has a strong sense of hospitality, grace, honor and loyalty…things to be honored and remembered. This is not true just of the South. America also has a history of slavery, as does Western Civilization in general…as well as World History. We have many things in our various heritages to be proud of…and many things that should be repudiated. I grew up with a strong sense of pride in my Southern heritage as well as my American heritage. I also was raised with a strong stance against racism in any form. For me, these are not conflicting positions. I find no contradiction in being both proud of my Southern heritage and strongly opposed to racism. So, yes, I have very strong opinions in opposition to racism. I also have pride in my heritage as a Southerner. I have a love of history and enjoy exploring historical sites while visualizing the scenes from long ago. I am generally in favor of maintaining historical monuments and cultural symbols. Lately, though, some of the symbols of the historical Confederacy have been confiscated for use by white supremacists as symbols of racist ideology. And lately, I have become more aware that some things that are, to me, simply symbols of a history and by-gone era are, to others, symbols of oppression, slavery, and racism. In hindsight, I can understand why. The Southern states seceded from the Union and formed the Confederate States of America for the explicit purpose of protecting and preserving the institution of slavery, as well as all the institutional racism that accompanied the institution of slavery. Yes, this is an over-simplification. Yes, there were other issues involved…issues of a constitutional crisis…of state’s rights…of economy…of fear of a slave uprising…of violence perpetrated by abolitionists. Yet, all of these to one extent or another were brought to fruition as a by-product of the slavery issue. Slavery was the central issue at the time, and even a brief summary of the various constitutions of the states making up the Confederacy make this abundantly clear. So, despite my personal view of embracing the good while repudiating the bad, it really was quite predictable that symbols of the Confederacy would be viewed by some as symbols of racism and white supremacy ideology. This becomes even clearer as we recognize that the vast majority of Confederate monuments are not historical to the era of the Confederate States of America at all. The vast majority of those monuments were erected 60 to 100 years after the Civil War ended…for the explicit purpose of preserving symbols of a fading ideology. I don’t know exactly what the erectors of those monuments had in mind at the time. I would like to think they, like myself, were interested in preserving memories of the good of our heritage while repudiating the bad. However, since that same era saw the rise of the Ku Klux Klan, the fact is that many of those monuments were, in all likelihood, erected for the specific purpose of instilling a sense of pride in a culture of institutional racism. So, should the Confederate monuments go? As sad as I would be to see them gone…and as a proud son of the Southland I would be sad…I would far rather see them removed than to see them used as symbols of hatred and racism…or to see them viewed as symbols of oppression and fear. So, yes, it is time for them to go. Some might could stay, such as those explicitly commemorating a battlefield or maybe those truly historic to the era of the Confederate States of America. Some might could be recontextualized or moved to museums accompanied by explanations of why they were erected and why they were removed. But any monuments erected during the Jim Crow period for the purpose of validating racism need to go, one way or another. And all this rhetoric about slippery slopes and where to draw lines…rhetoric about are statues of George Washington and Thomas Jefferson going to be next…it is just that…empty rhetoric to support an unsupportable position. Because, whether we like it or not, the Confederate States of America was founded for the specific purpose of protecting and preserving the institution of slavery. Whether we like it or not, the Confederate symbols have become symbols of racism, bigotry, hatred, and white supremacy ideology. The same is not true of the United States of America. Yes, slavery existed in the early days of American history…that is a historical fact. However, the United States was not founded for the explicit purpose of protecting and preserving the institution of slavery, nor are monuments of American Independence viewed as symbols of racism and hatred. The slippery slope argument is an illogical argument…an attempt to equate two completely different things that simply are not equal…with the intent of shutting down reasonable discussion of the topic. That’s how this proud Southerner sees it. That nagging worry at the back of my mind found fulfillment. My worst fear became reality. We have made amazing progress in 60 rides! Knockout has matured from a green-broke, frightened, spooky, flighty colt to a pretty reliable young horse. My progress has been no less remarkable in my own way. I began riding Knockout as I was recovering from cancer treatment and my physical strength has returned as we worked together. 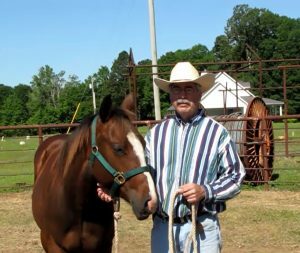 I have learned a lot about horsemanship and relationships. I have learned a lot about myself. I have faced a few fears and overcome a few insecurities. The first time I rode Knockout I was scared. Cancer treatment was quite an ordeal, and to be honest I was feeling pretty fragile. I didn’t trust my own lack of strength or my ability to recuperate. But I was determined to ride him. 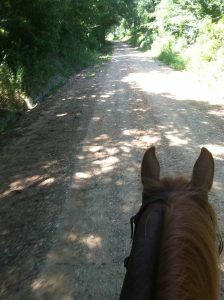 So, I thoroughly disked the arena to a nice smooth carpet of thick soft dirt, and climbed in the saddle. That first ride started out pleasant enough. We walked around the arena both directions a few times with no mishaps. I asked for a trot and Knockout sprang into a gallop. Startled, I pulled back…and Knockout promptly bucked me off. I stood up, dusted myself off, realized I wasn’t hurt…smiled…and remounted. That buck-off was the best thing for my confidence. It showed me I wasn’t as fragile as I’d come to believe. I could still take a fall from 15 hands into soft arena dirt without doing any damage. Knockout and I have done around 60 rides since then. 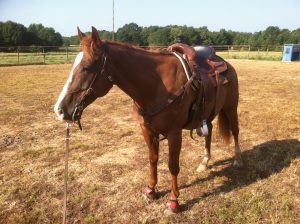 We’ve come a long way in learning to relax under saddle. We’ve done a lot of work on transitions from walking to trotting to loping to stopping to backing…and every combination thereof. And we’ve developed a relationship based on clear communication, mutual respect, and mutual trust. There’s a limit to that trust, though. Knockout is still a prey animal and prey animals are prone to flight. That first ride was not his last time to bolt or buck…nor was it my last time to panic and mishandle a situation. We’ve had several opportunities to practice the one-rein stop. We’ve also had plenty of opportunities for me to practice relaxing and going with him when he startles. The startles are now much less frequent. They’re much more controlled when they do happen. And I respond much more calmly than I did previously. Overall, at this stage, I consider Knockout to be a pretty solid young horse…and us to be a pretty solid team. Yet, I’ve still retained this nagging concern at the back of my consciousness. What if Knockout bolts in thick woods? How would we deal with an all-out runaway situation through thick trees and low-hanging branches? It’s not a pretty picture…and no matter how much I tried to plan for it I had trouble envisioning a happy ending to that particular scenario. Out in the open, I have time to respond and room to maneuver. I have options like turning a big circle or performing a one-reined stop. On a narrow trail through thick forest, there is neither room nor time for any of that. So I dealt with it the best I could…by trying to minimize the risk of it happening. 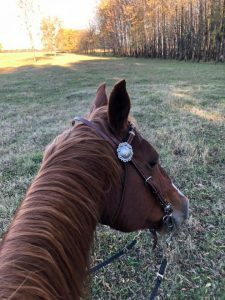 Riding the gravel roads, we practiced transitions over and over, going from a walk to a canter…from a canter to a full stop with backing…from backing straight back to a canter. We practiced over and over, building muscle memory…building confidence…so we were both more comfortable with speed and with sudden application of the bit at speed. Yet the nagging doubt at the fringe of my consciousness still nagged…because I knew practice while we’re both relaxed and focused is not the same thing as a real life bolt on a terrified horse who believes he is fleeing for his life. Yesterday morning we had a really nice ride down the gravel roads. Knockout wanted to turn up a trail running through a pine thicket and I decided to go with him. We rode about a quarter mile or so down the trail and all was good until we came to a place where the trail runs between two large oak trees with low hanging branches covered in dense foliage. I reached my right hand out to move a branch aside and Knockout startled at the sudden movement of the leaf-laden branch. Normally, this would not be a big deal…normally I would lightly check him and that would be the end of it. This time, though, Knockout’s startle carried us deeper into the thick foliage, moving and rustling the entire branch. To Knockout, it must have seemed as if the whole forest had suddenly lunged toward him in an attack. My light check was ignored and Knockout plunged forward…crashing us both thru the pair of low-hanging heavily-leaved oak branches…with lots of added movement and added rustling. For a split second, Knockout sat back on his hindquarters. For just a split second, he responded to my cue to stop. But in that split second I felt his energy gathering for another leap forward. Experience told me that next leap would either be a terrified bolt through the bit or a bucking fit to escape the pressure of the bit from the front combined with that terrifying ‘predator’ chasing from behind. In that split second, I realized Knockout was trapped between a rock and a hard place with adrenaline-fueled energy that was going to release somewhere. In that split second, I dropped all pressure from the bit and gave Knockout plenty of slack in the reins. Again, Knockout sat back on his hind quarters. Again I released pressure, putting plenty of slack in the reins. That was it. Three leaps…two whoas…and it was over. The catastrophe was averted and we were once again calmly walking down the path through the pine thicket. I smiled, leaned forward, petted Knockout’s neck and told him what a brave horse he is for trusting me enough to follow my direction even when he is terrified. As we continued the ride home, my smile grew as I realized my worst fear had become reality…and together we had handled it just fine. Yesterday, my confidence grew just a bit. I believe Knockout’s confidence also grew. We were both scared, yet we both chose to listen to each other and to trust each other…and we learned that together we can handle tense situations just fine. Sometimes, we have to experience our worst fear becoming reality in order to take the next step in building confidence. And you know what? 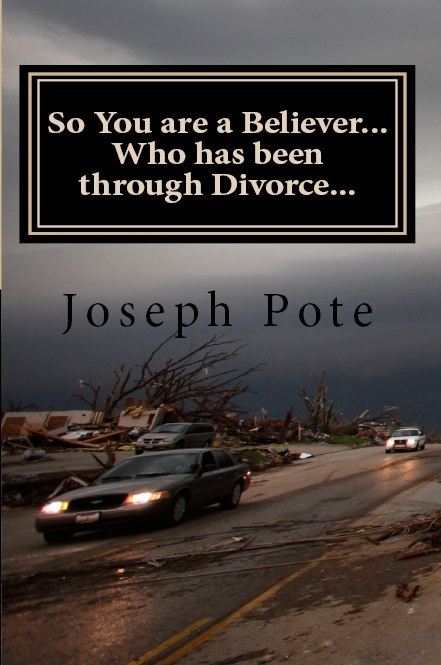 Through every one of those situations, God has proven Himself faithful. He has been my constant friend and companion thru every difficulty. 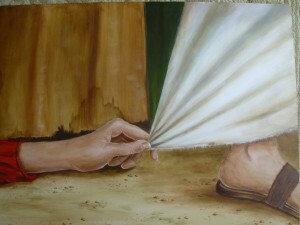 Through those difficulties, my faith in Him has grown and our relationship has deepened. When our worst fears become reality is when the relationship is given a chance to be tested and proven. How about you? In what areas has your confidence grown through seeing your fears become reality?